A western Kundalini yogi travels to India to experience yoga. 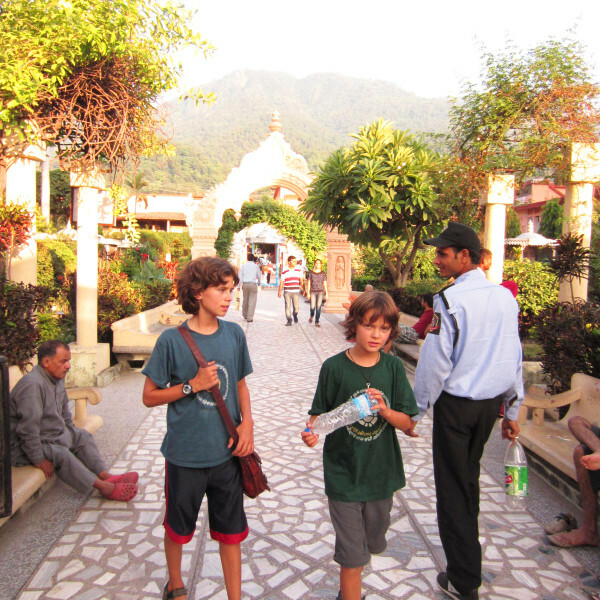 This time last year, my sons (then 9 and 12) and I were making our final preparations for a 5 month journey around the world, one month of that time to be spent in India. I wrote a weekly blog while we were away, but since returning, even though my mind will often take me back to India’s sights and smells, I have not written about her at all. I am not sure why. Those 29 days are still seeping into my consciousness, and with all things India, I often find it difficult to describe my experience. Certain images will show up unexpectedly, scenes as contrasting as the country itself. Pictures of a quiet camel ride into the Thar Desert will be overtaken with memories of being practically swarmed upon as we boarded a local train in an incredibly hot and dry Rajasthan. Then come images of grand palaces and glittering ornamentation, followed by scenes of mutilated children begging in filthy streets. I want to respect her with words like incredible, beauty, majesty, splendor, spiritual, life-altering. Words of admonishment come to mind too, like filthy, congested, overpowering and appalling. Travelling India is possibly one of the most challenging things I have ever done. As any yogi would going to the heartland, I craved yoga while we travelled. I looked for signs of it everywhere, but nothing. Where the heck is all the yoga? I wondered. I muddled daily through my own early morning practice, my “Ong Namo Guru Dev Namos” competing with faint foreign chanting emanating from dawn-dusted alleyways. But my mind rarely found its stillness, as thoughts of finding breakfast for the kids competed with pungent smells of dhal and curry cooking in the early hours. Arriving in Rishikesh, self proclaimed “Yoga Capital of the World”, I was looking forward to 5 days of bliss at the Ashram located right on the banks of the Ganges. Surely the boys would enjoy this experience too, I was excited for us all to take in an early morning and late afternoon practice and immerse ourselves completely in the energy of this divine place. Time to be still, to relax and rejuvenate our spirits. Oh the disillusioned pre-travelling mind! We arrived in Rishiskesh after a 14 hour, arduous, and nail-biting overnight car ride down the mountain from Dharamsala, home of the Dalai Lama. We all wrestled with fitful sleep and several hours in, I narrowly diverted some inappropriate and intimate behaviour from our driver (who had come highly recommended from other travellers). I was sickened by his advances, and although he was not at all aggressive, I began to initially panic. It was pitch black, 3:00 am, and we were in the middle of nowhere. What was I thinking travelling this way with my children?! I fished deep for my courage, and slapped him hard, spitting harsh and assertive words at him. He said nothing, sunk within his shame, offered me a blanket and left me alone. I seethed my way back into a semi-coma until the thick, smoggy and humid morning air seeped through the car vents. In Rishikesh, we passed massive billboards announcing Yoga, Meditation, Retreats (finally! ), my spirits lifted. In true Indian style, it took us 2 hours to find the ashram, after asking a half dozen people, all waving arms in different directions. I had to get out of that car… and breathe. Deep. Finally offloaded at the back entrance of the Ashram, I said not a word to our driver as I removed our luggage from the trunk. He understood my disappointment and anger by absence of what should have been a hefty tip. I felt his apology in the light of the new morning as he quietly drove away, but I wonder if it was for missing out on the equivalent of a week’s wages or if he was truly sorry for putting himself upon me. I felt wounded. Maybe he did, too. My craving for a yoga class intensified. We checked into our sparse, simple lodgings that had us all wondering about what lay ahead. Mold laden walls covered the outside toilet and bathroom and our 2 inch lumpy mattresses and non-existent pillows made us crave simple comforts. It was hot and humid on the Ganges, the temperature felt like 50 degrees. But we were here for an enlightening experience and I remained convinced that what we had endured to get here was going to show its fruits any moment. No tree did we harvest. The boys groaned and grumbled and wrestled with aching tummies, which our first humble ashram meal did nothing to comfort. We got achingly lost as we attempted to navigate our way into the town, only to discover that this seemed to be the only Indian town not to be swarming with noisy Rickshaws! Not one. Nothing. So we walked, for miles in the pounding heat. We passed Swamis, Gurus, and Yogis of all descriptions. Some wearing orange robes, others wearing Lululemon. Yogis from all walks of life, from the west and from the east were here to study and practice. (Or to smoke “RishikHASH”.) The whole town took on a vibe of 70’s hippy chic infused with Kombucha and Chakra jewellery – monkeys and Indian natives taking advantage of it all. It was quite odd. I asked around about a Kundalini Yoga class. Nobody had heard of it. We were exhausted to say the least. 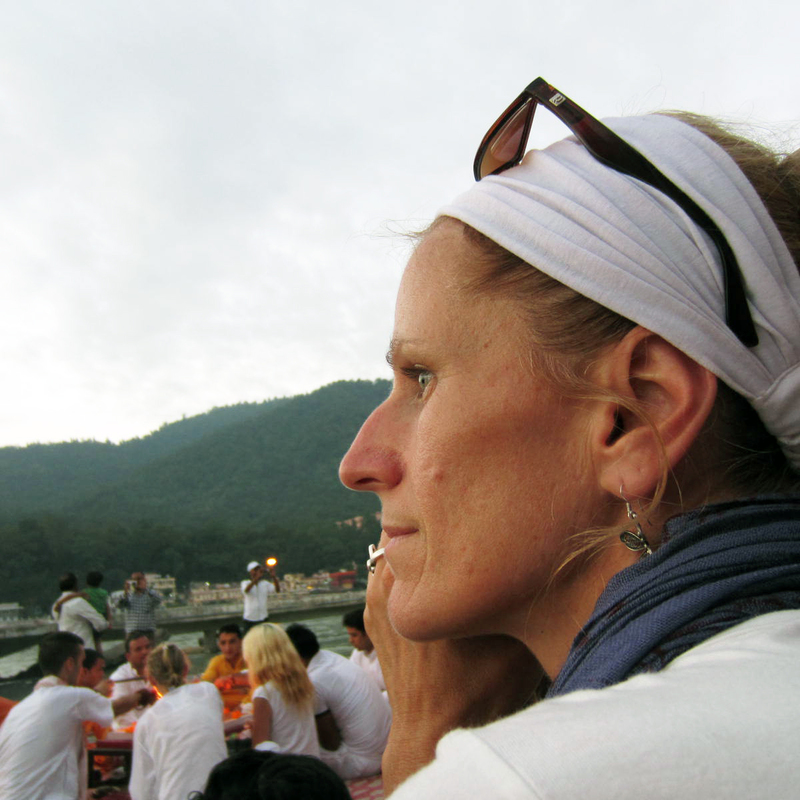 It was day 23 in India, the second month into our travels, and I had come to Rishikesh for my love of Yoga. 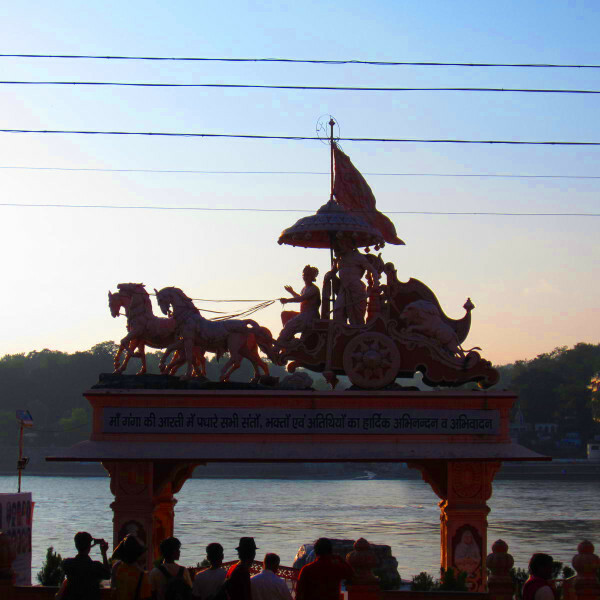 I had yearned to come here, to the banks of the Ganges in the past, to immerse into teacher trainings. I knew friends who had come and left changed – I just wanted to leave. Period. At 3:00 pm that first day, back at the Ashram, we experienced our first and last yoga class in India. I was determined to turn this around. The boys were beautifully and unselfishly obliging, knowing how much this meant to me. The heat was oppressive and we were a ball of dirty, street sweat. We arrived to a full class of white westerners, all waiting to get their yoga on. We took our places at the back of the concrete floored hall and waited eagerly for our teacher. I had visions of an Indian man with a long beard, thick accent and warm eyes. (Forgive the stereotype). Imagine my surprise when we were greeted by a middle aged American woman, slightly overweight with short, graying hair. I will not lie – I was disappointed and could not reverse the loops my mind was now on. All this way, to the Yoga Capital of the World, in the majesty and challenge that is India to have a very brash ”Liz Brown” from Missouri, USA, instruct us in what I would describe as an incredibly soul-sucking yoga class. (Apologies to “Liz” – in a different frame of mind, I may not have been so judgmental). Clearly my meditation practice was taking a hit, because my neutral mind was nowhere to be found. I was agitated, distracted, and quickly overheating. I have never before felt so “un-yogic”. I turned on the large fans in the back of the room, only to have our instructor very harshly yell down the hall for me to turn them off as nobody could hear her. I reluctantly obliged. After 30 minutes, we were all in crow pose (even my 9 year old son!) and I have to say that it is the best crow I have ever practiced… because I wanted to screech like one and fly the heck out of there! Ten minutes later, my oldest son had given up, and was melting into the back wall, and my younger had quickly lost his brief burst of enthusiasm. I was clearly done for. The class was uninspiring, so we snuck out the back door – like naughty school kids skipping class. This was a first, never before have I left a yoga class midway through. I half expected “Liz” to coming running out and demanding we went back in to finish her sequence. Lucky for her, she did not. That night I fell quite ill with tummy aches I could not ease, and my mind churned more than my stomach. I reflected on its state and all it’s judgements: what happened to over 10 years of yoga? Why do I feel so disconnected here when I want to experience the complete opposite? What have I dragged my kids through? What am I doing here? I chanted silently trying to access my neutrality and bring in some healing. “Wahe Guru, Wahe Guru, Waha Guru …” (translation: “from darkness to light”). It felt so good, these words from ancient India, but words that I could not find here. I had them inside me; this was my yoga. And this was a lesson that years on a mat may not have taught me. I surrendered, stopped searching, and let go. We left Rishikesh the next morning in an air-conditioned taxi, bound for Delhi, me still with a heavy heart, the boys happier than I had seen them in days. My experience here was profound, but not in ways that I had initially imagined. It was not my time to immerse myself into yoga – that was clear. I am not sure how I thought I would accomplish this with my 2 kids in tow, but I accepted it now. 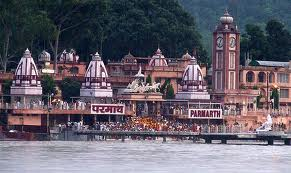 In strange ways, I believe we were strengthened by the energy of Mother Ganges. We soaked our feet in her waters and took in the profound and moving nightly Ganga Aarti Ceremony. We got a glimpse into Ashram life and were humbled by its simple daily rituals. I connected with my daily practice and began to move into a more neutral, capitulated place. India had turned me inside out, but in the end, I returned to a better, wiser, and less grasping version of my Sat Nam – my true self. Thank you, Rishikesh. Thank you, India. I am now ready to tell more tales about her. Shanti. Greetings Victoria , What a profound experience in & out of the soul with 2 kids in tow. keep up a daily yoga practice & meditate on a recent trip overseas was trying enough…. Sadhana @ the Alchemy Yoga Centre in London which everybody craved about but alas the business had closed last summer. Sat Naam Janine. Thank you for your comments and we look forward to seeing you when you return to Ottawa. Happy travels! I appreciate the honesty of your words, Victoria. You had me laughing out loud with the Liz Brown scene, and feeling angry about your experience with the driver. It takes courage to write like this. I love the part where you chant Wahe Guru and suddenly realize that you don’t have to go searching for Yoga, it’s inside of you…always. It’s fascinating how lessons rarely come to us in the way we think they will. Thanks for this reminder. See you soon in one of your genuine, powerful classes! Hi Victoria, Thanks for sharing your experience. I am also visit India to join the yoga training with AYM yoga center. and Hope i also get a good experience with this center and also this place. Nice post Running from Rishikesh: A Western Kundalini . Thanks for sharing. Hey Victoria thanks for sharing this information or your amazing experience in india.